Despite earlier denials by the Waco Police Department, ballistics reports revealed that four of the bikers killed in the Twin Peaks shooting were shot by the same caliber of rifle bullet used by Waco police on the day of the shooting. 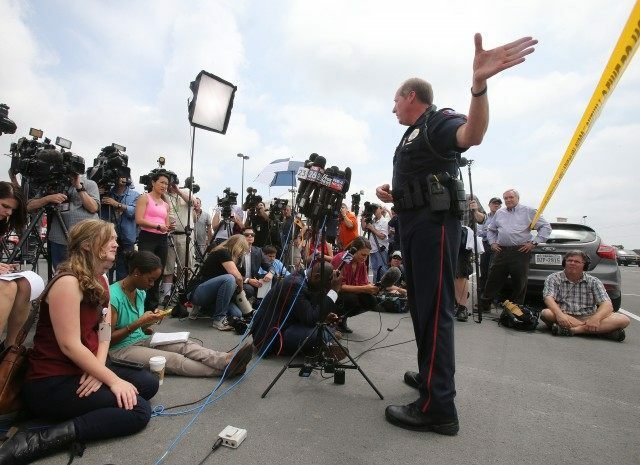 Ballistics reports reveal four of the bikers were killed by shots from .223 caliber rifles, according to an AP report published on KWTX in Waco. This is the type of rifle reportedly used by police on the day of the shooting involving the bikers who gathered at a planned political meeting at the Twin Peaks restaurant in Waco. Two of the slain Twin Peaks Bikers bikers only had wounds from a .223 caliber weapon. Two other bikers had the .223 wounds along with wounds from other guns. A total of 20 bikers were wounded during the shooting. Now the autopsy reports are out and it certainly appears the police sergeant, now running for sheriff against incumbent Sheriff Parnell McNamara, might owe CNN an apology. It has not yet been made clear if any of the bikers were carrying weapons that used .223 caliber ammunition. All nine of the bikers who were killed were members of either the Banditos or Cossacks motorcycle clubs, the AP reported. Jesus Delgado Rodriguez, 65, died of gunshot wounds of the head and trunk. Jacob Lee Rhyne, 39, died of gunshot wounds to the neck. Richard Vincent Kirshner, Jr., 47, died of gunshot wounds but the report did not specify where he was shot. Richard Matthew Jordan, III, 31, died of gunshot wounds to the head. Wayne Lee Campbell, 43, died of gunshot wounds to the head and trunk. Daniel Raymond Boyett, 44, died of gunshot wounds to the head. Matthew Mark Smith, 27, died of gunshot wounds to the trunk. Manuel Issac Rodriguez, 40, died of gunshot wounds but the report did not specify where he was shot. And Charles Wayne Russell, 46, died of gunshot wounds to the chest.